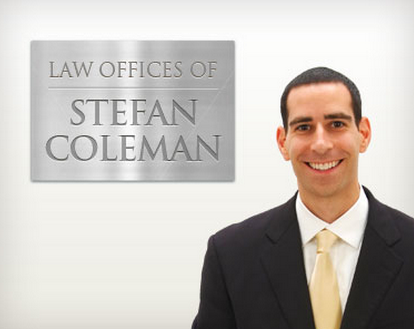 Lawyer Stefan Coleman is the founder of the Law Offices of Stefan Coleman. The firm was created in the spirit of community justice, using the law to protect the rights of consumers that are unfairly and illegally taken advantage of by corporations. Privacy Rights: Protecting the privacy of consumers who have experienced a beach of data including the exposure of credit card data, medical data, internet browsing records, email data and more. If sensitive data has been stolen or was leaked due to negligence, Law Offices of Stefan Coleman will fight to protect the rights of the affected consumers. Unfair Business Practices: Fighting against corporations who use deceptive business tactics, or misrepresent their goods/services to consumers. This includes false advertising, unlawful up-selling and purchases that are done without the consent of the consumer. Telephone Consumer Protection: Stopping telemarketers from violating the Telephone Consumer Protection Act, National Do Not Call Registry and other laws governing the use of telemarketing to consumers. This includes illegal robocalls, calls made using an auto-dialer, calls made without consent, unlawful text messages and unlawful faxes. Product Defects: Helping consumers recover money from companies that either sell products that do not work, or do not work as they were advertised. In limited cases, lawyer Stefan Coleman will also work on behalf of companies who realize the need to adapt to the ever-changing legal and regulatory landscape as it relates to data, privacy and advertising. If you have any questions or just want to contact us about a certain case you can always email us at [email protected] or call our office (877) 333-9427.